The BK and I tried something like this recently at brunch. However, they served sliced tomatoes on top of goat cheese and didn’t add quite enough onion for my taste. I thought maybe we could do better. We had a couple of large sweet onions, so I sliced one up a day or so earlier and cooked it down until it caramelized — low and slow — for quesadillas. The remaining onions, my last lonely tomato, and a bit of goat cheese were the inspirations for this recipe. Delicious!! 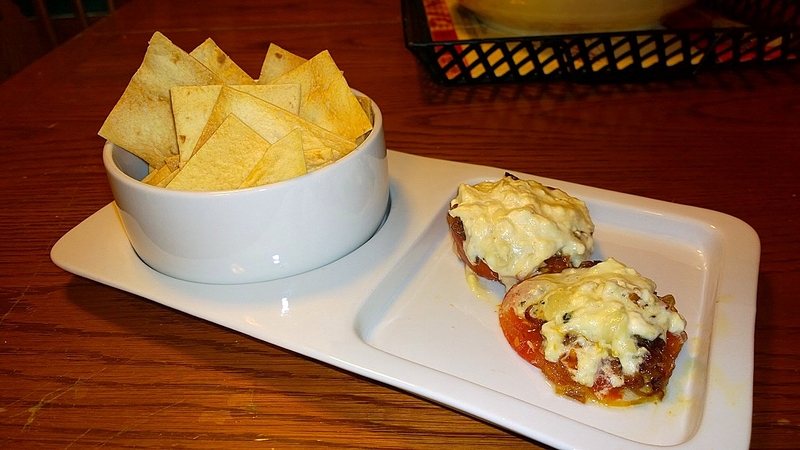 This turned out to be a perfect game day snack. 2. Brush both sides of the tortillas with Tuscan Herb Olive Oil. 3. Cut each tortilla into pieces and place them in a single layer on a baking tray. 4. Season with sea salt to taste. 5. Bake until golden brown, turning the baking sheet once (12-15 minutes). Set aside to cool. 2. Cut the tomato in half and remove the seeds. 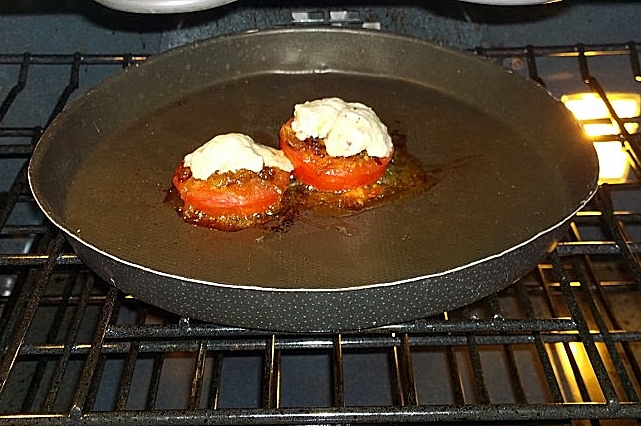 Place tomatoes cut-side up on a baking sheet. 3. Drizzle with Tuscan Herb olive oil and season with salt & pepper. 4. Bake until the tomatoes are tender (about 10-12 minutes). 5. Place the caramelized onions in the middle of each tomato and top with goat cheese. 6. Bake for a few more minutes until the goat cheese is soft and just browning.